Create and edit Epub and Kindle books fast with Anthemion Jutoh. Import from existing files, design your own cover, and much more. 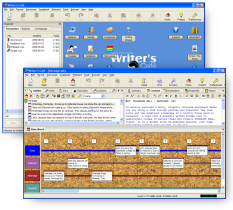 Comprehensive, easy-to-use software for every fiction writer. Try it now! Designed by published novelist Harriet Smart, Writer's Café also includes a notebook, journal, research organiser, pinboard, inspirational quotations, daily writing tips, writing exercises, name generation, and a 60-page e-book, Fiction: The Facts, distilling 20 years of writing experience. Writer's Café is designed to be a playground for the imagination, making writing fiction fun and fulfilling. But it's also a serious tool for professionals, with highly configurable formatting, import/export and reporting facilities. Click here to explore Writer's Café in detail. Also check out the latest news. Download the demo for Windows, Linux, or Mac OS X, then if you like it, you can buy it and turn your demo into a fully working version. Registered owners have access to the full Fiction: The Facts ebook and can create more than 20 cards and scraps.